In grade school I began writing my first novel, about a fearless girl, her collie, and two loving parents. The Cohen Family, Crayola-illustrated, was, alas, never to be finished...or found. That set the pattern for my writing. I always burned to write. In my preteens, I wrote fiction, longhand ─ mostly in the basement, away from family tumult and, especially, my mother. In my teens I switched to electronic typewriter, later, grudgingly, to a computer. I continued to write several times a week, sometimes for weeks or months at a time. There were, however, times I didn’t write for weeks, months, or chillingly ─ years! The Cohen Family was definitely and defiantly a novel. Unlike my protagonist, I was burdened with fear and anxiety; I had a sister, but no collie or pet of any furry or feathery kind, and my parents were not demonstrative but distant, and, most likely, mildly to deeply depressed. Why stops and starts? My mother, no doubt parroting her own mother or father, labeled me noisy, lazy, and selfish. She told me to shut up, questioned how I “dared” talk back to her. Eventually, I knew how she felt about any topic before I understood my own mind or heart. I apologized to chairs for accidentally kicking them. Did not trust my instincts. Thought if I could do it, it couldn’t worth much. That, of course, applied to my writing (and, later, my editing skills). The first person to say I wrote well was an English Literature professor at Brooklyn College. I don’t recall her name or what she said; it was complimentary and therefore, scared me so much I forgot every word she uttered! After graduating from college at the age of twenty I noticed an ad for an arts reviewer in my local Brooklyn newspaper, The Canarsie Courier. My first bylines ─ for theatre, book, and restaurant reviews ─ appeared. My first checks for writing awaited me at the newspaper office. I also penned humor and travel pieces. I felt giddy, which, to me, felt alien. I made the mistake of showing a published review to my mother. “So who says it’s bad?” she said. Not long after, I stopped writing. But the voice within me possessed chutzpah and stubbornness. In subsequent years I enrolled in fiction and nonfiction writing courses at New York University and The New School. I wrote short stories, two of which I revised extensively and published, at least a decade later. I started and stopped and started again an ambitious coming-of-age novel set in the South. My teachers were encouraging. In the nineteen-nineties I divided my time between writing, performing, publishing poetry, and writing fiction. Through a disastrous marriage, years of compulsive overeating, unfulfilling jobs and relationships, two different psychiatric diagnoses, several surgeries, and, finally, disability ─ through all this, I intermittently wrote fiction. In 2010, I had to leave my editing job at a major accounting firm and go on disability. This was demoralizing and financially terrifying. With the aid of psychotherapy, corrected medications, inherent feistiness, beloved friends and family, and, finally, the right man, I made it through the worst times I could imagine. It was no longer acceptable to me to be overmedicated, depressed, and scared to write. With physical and occupational therapy, as well as stationary bike riding at home, I am now getting around with a walker. I realized in January 2017 that I’d been writing and submitting flash fiction consistently since January 2015. In 2014, I discovered this form, began reading expert practitioners, and freed myself to write what I needed and wanted to. I also started another novel that I will get back to. I submit fiction, nonfiction, or poetry to literary journals on average three times per week. I’ve received a slew of rejections, but a fair number of acceptances, too. I’ve started editing again on a freelance basis. It brings a little money but, more importantly, higher self-esteem and a sharper mind. My best news? My fiction collection, My Secret Life with Chris Noth And Other Stories, will be published by Poets Wear Prada in autumn, 2017! When I was fourteen, I tagged along with my friend Sheila Giddins and her parents to Kutsher’s Hotel and Country Club in the Catskill Mountains. No one called my friend Giddy Giddins, but I always wanted to, primarily because she was pretty somber. She was also prettier, thinner, and blonder. I wasn’t blonde at all. I was a brunette, chubby, but better-looking now that I wore contact lenses instead of thick glasses. Sheila’s parents probably felt bad for me because my father had died the winter before. I didn’t mind their pity if it meant I’d be able to get away from my mother in Brooklyn. Three days’ escape from fluttering yahrzeit candles* and death dates circled in red on the wall calendar beat no escape at all. On the second day, I awakened early and decided to walk the grounds. The sky was clear and sunnier than in Brooklyn. I felt light and, for a change, hopeful. I met the blond boy that day. He was tall and Gentile, and so I went row boating with him. On the boat he told me he had just returned from a one-year tour of duty in Vietnam. He saw fellow soldiers blown up. He said they were friends. I pictured bullets piercing uniforms and flesh, blood spurting, bodies bursting apart. I forced myself to listen because he needed to talk and there was nothing else I could do for him. I thought of apple pancakes afterwards. The blond boy needed a receptacle for his sadness. I could take it. I had seen death, too: my fifty-year-old father, body stiff as the board under my parents’ mattress. Eyes staring up at a void. No blood. * Yahrzeit candles: Jewish memorial candles. Iris N. Schwartz is a fiction and nonfiction writer, as well as a Pushcart-Prize-nominated poet. 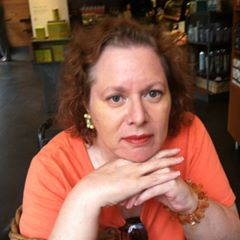 Her work has appeared in such journals as 101 Words, Algebra of Owls, Bindweed Magazine, Connotation Press, Flash Fiction Friday, The Flash Fiction Press, Gyroscope Review, Jellyfish Review, Quail Bell Magazine, Random Sample Review, The Tribe Journal, and, most recently, Anthology Askew: Love Gone Askew. Her first fiction collection, My Secret Life with Chris Noth And Other Stories, will be published by Poets Wear Prada in autumn 2017.